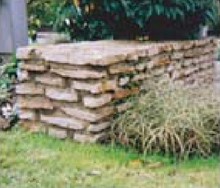 A NATURAL hydraulic binder is a binder manufactured from a single natural raw material, without additives. 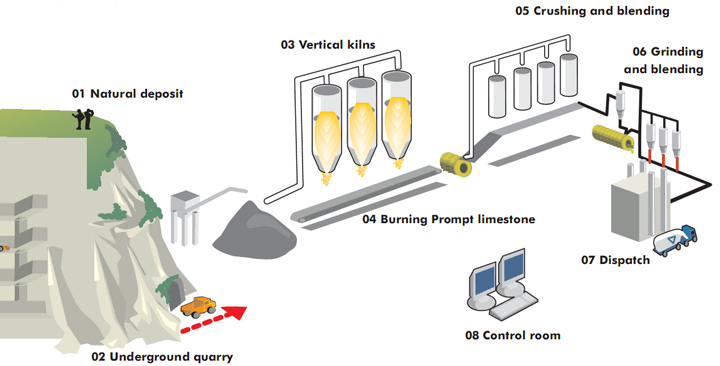 PROMPT is a NATURAL HYDRAULIC BINDER which results from firing an argillaceous limestone of regular composition extracted from homogeneous rock strata, between 800 and 1200oC, followed by very fine grinding. For more than 150 years, in the Chartreuse mountains, a unique natural deposit has been exploited to manufacture Prompt. This limestone deposit, in the French Alps to the north of Grenoble, consists of folds of sedimentary strata formed during the formation of the Alps. A single geological layer makes up this unique natural deposit. It consists of an argillaceous limestone whose chemical and mineralogical compositions are consistent, precise and ideal for manufacturing cement without external additives. The tables below show the average values of the physical characteristics of PROMPT obtained after completion of factory quality control inspections. The table below shows the average values of the chemical characteristics of PROMPT obtained after completion of factory quality control inspections. PROMPT: a true force of nature ! 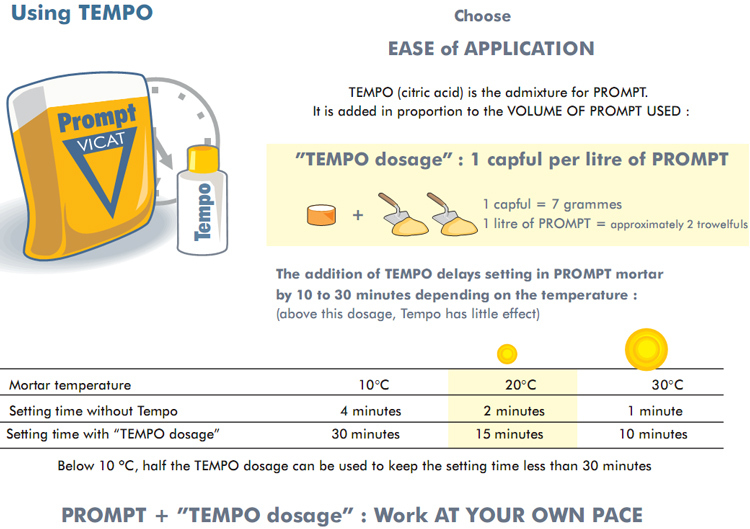 with TEMPO, 4 MPa is obtained after 90 minutes. 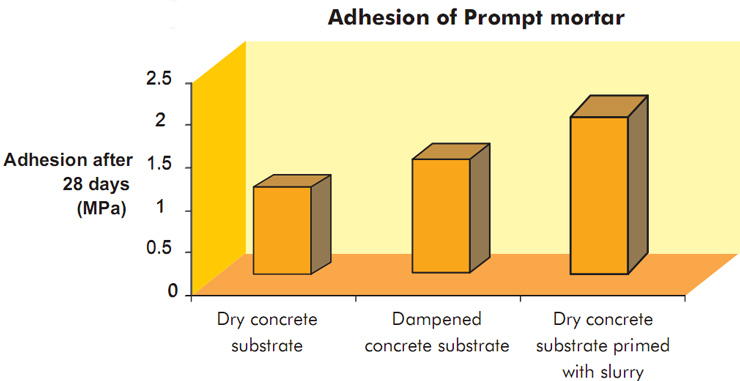 Due to its high fines content, Prompt develops excellent adhesion to all types of building material ; adhesion to a damp surface is significantly better than that obtained on a dry surface ; it is improved even more if a slurry* is applied beforehand. * A layer of mortar on the substrate of almost zero thickness used to prime the substrate before laying a full thickness of mortar. 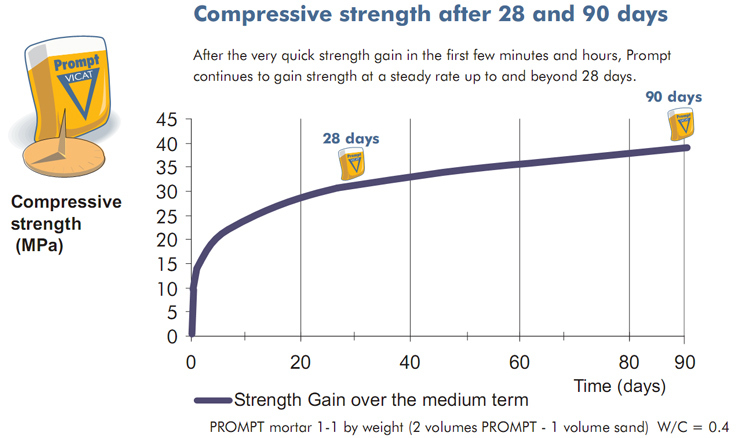 This continued increase in strength improves the compactness of the mortar as the years progress ; this is an important factor in the DURABILITY of PROMPT-based mortars and concretes. 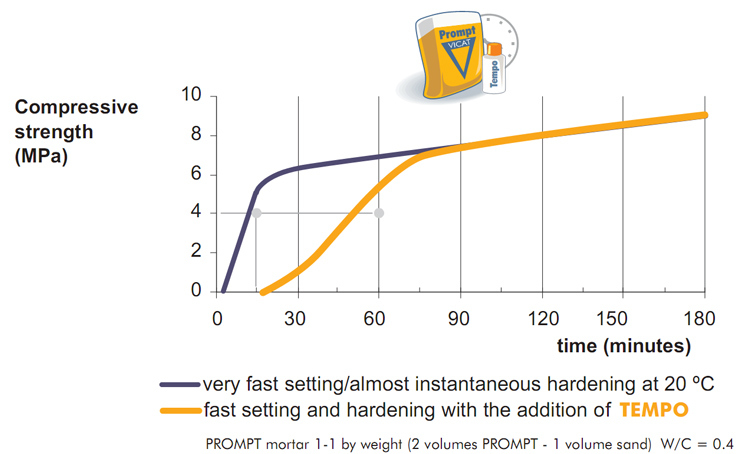 Hydration of the highly reactive PROMPT aluminates enables development of strength in the very first quarter of an hour ; slow hydration of the C2S generates a strength gain over several years ; this phenomenon, which provides the possibility of autogenous healing over a long period, is another important factor in DURABILITY. PROMPT mortar behaves very well in the presence of sulphated water. This slow increase in expansion is explained by the gradual reduction in permeability of the Prompt mortar, as well as the limited release of lime during hydration; these results demonstrate the excellent resistance of PROMPT mortar to concentrated sulphated water. PROMPT meets French Standards for sea-water setting cements. Having demonstrated excellent behaviour during long-term tests, PROMPT has been deemed suitable for work at sea. It therefore has good resistance to attack from sea air. In parallel with the strength gain, porosity is red and waterproofing enhanced. 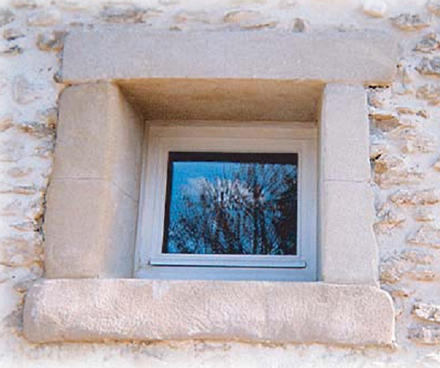 Works with lime mixes Waterproof rendering. Usual mix : 1 volume PROMPT/1 volume sand. Mixing Prompt Mortar ready for use. Prepare site before preparing PROMPT mortar. Do not mix PROMPT and sand in advance : the moisture in the sand hydrates PROMPT and triggers the start of setting. Avoid excessive water, a main cause of shrinkage and cracking. Mortar with very wet sand will need less water. Only prepare as much as can be used before the mortar starts to set. Work on a CLEAN DAMP substrate (for adhesion). The mortar must be laid completely BEFORE setting starts to have sufficient time to work at your convenience, use the TEMPO admixture. TEMPERATURE influences the initial setting time : warm weather reduces it, cold weather increases it ; the addition of TEMPO means that in warm weather you still have sufficient time to complete the job. AFTER setting starts: Do not add water, stir or smooth over: Setting only occurs once (risk of breaking the set). CLOSE the bag carefully after use, and store it upside down in a dry place.